Field and green house vegetables, cut flower and nursery crops. Tiny parasitic wasp with orange coloured abdomen and black head and thorax. 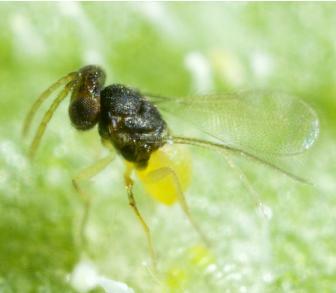 Lays its eggs into second, third and fourth nymphal stages of whitefly. 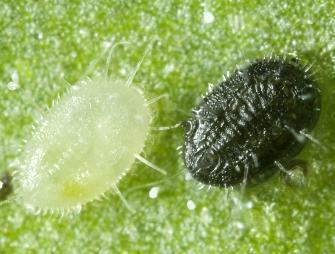 The encarsia egg then hatches inside the whitefly scale and the wasp larva feeds inside the scale. The scale will turn black within two weeks and a wasp will emerge soon after. 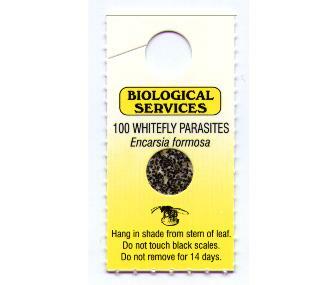 Supplied on cards each containing 100+ parasitised white fly scales. Hook the cards onto a plant twig or on support wires etc. 2,000 parasites per 1,000 m2. Field crops: inoculatively applications of 2,000-5,000 per hectare. Or view or download a PDF file of the Book entry for Encarsia.